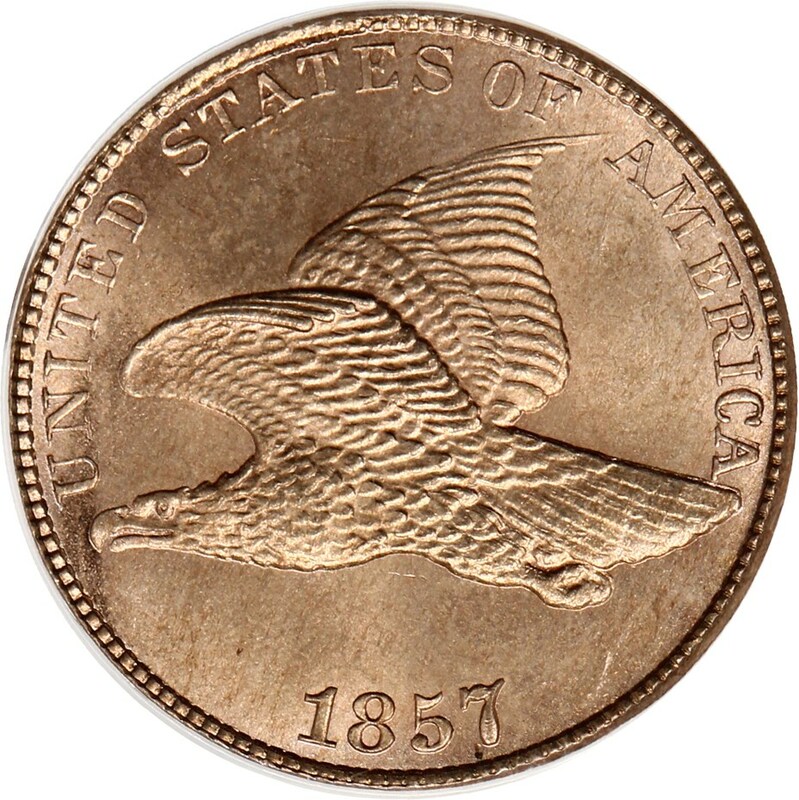 America's first small-cent was the Flying Eagle cent, which was originally struck in 1856 as a pattern and was produced for mass circulation in 1857 and 1858. The change came after the United States Mint began experimenting with new pattern cents in the mid 1850s due to increased costs of producing the small cent. The Flying Eagle cent was designed by United States Mint Chief Engraver James B. Longacre and is an adaption of the Christian Gobrecht pattern silver dollars struck in the mid 1830s. Approximately 1,800 Flying Eagle cents were struck with the 1856 date for use as presentation pieces, and possibly some were made at a later point to satisfy the demands of collectors who wanted examples of the coin. The Flying Eagle cent was officially unveiled for circulation on May 25, 1857, which was during the period that the United States government was demonetizing foreign coinage that was still circulating throughout the nation as legal tender. The Flying Eagle cent is made from a composition of 88% copper, 12% nickel, and were widely dubbed ?nicks.? Though the Flying Eagle cent was in regular production for just two years, more than 40 million were struck and became quite popular with the public. For a coin that was produced for only two years (three when counting the popularly collected 1856 presentation piece, which did see limited circulation) at just the Philadelphia Mint, there are a surprising number of issues and varieties. These include the 1856 and 1857 regular issues, 1858 Large or Small Letters varieties, 1858/7 overdates, and proof specimens from 1856 and 1857, as well as proof variants of each the 1858 Small and Large Letters. While the Flying Eagle cent is widely collected as an extension of the Indian Head cent series, Flying Eagle pennies offer enough complexity as a standalone series to provide plenty of challenge to anyone desiring to focus solely on collecting and studying this first incarnation of the small cent.